Titusville is one of Florida’s hidden treasures, in the shadow of the booming rockets of Cape Canaveral and the fame of Cocoa Beach. They’re fine with that, and you will be too when you cut a little time from your trip to visit. Titusville, located on the mainland of Florida’s Space Coast west of the Cape, is perfect for a quick day trip. From outdoor recreation to the indoor treasures for your family’s resident history buff, you’re likely to find an afternoon visit well worth that precious time. 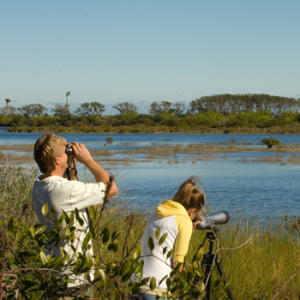 Taking a few hours to spot some wildlife at Merritt Island National Wildlife Refuge is a splendid way to soak in the summer sun. Established in 1963 and home to a wide array of creatures from bobcats to the critically endangered Florida Scrub Jay, the refuge is a relaxing time in Florida’s native environmental past. With activities ranging from hiking to fishing and an admittance fee of only $5, you can make a full day or simply a couple of hours exploring. Another quick stop in Titusville will have you flying just above the lily pads and gator tails of the still vast Florida swamps: airboat rides. These take anywhere from 30 minutes to a couple of hours and provide a scenic (and wonderfully loud) look at a different angle of Florida’s Space Coast. Picture salt air flying through your hair and calm water dashing beneath the bow. There are a lot of good options around Titusville for such a time, but Airboat Rides at Midway, just to the west of town, is one of the best. Valiant Air Command Warbird Museum: Classic military Americana located in the heart of Florida, this charming museum quietly holds the roaring engines of skies past. Get up close and personal with a C-47 Skytrain, an F-105 Thunderchief, or the legendary F-14 Tomcat. The 30,000 square feet of plane nostalgia is a must for history buffs and those who dream of flight. American Police Hall of Fame: Founded in 1960, this museum and memorial of American law enforcement is designed to be educational. It’s also moving. With an incredible tribute to the over 8,000 officers killed in the line of duty, you’ll come away with a new appreciation of those in blue. Playalinda Brewing Company: Beer. And some great atmosphere. Located in a renovated 100-year old hardware store, this is Titusville’s only micro-brewery. Their craft beer is fantastic and varied, and the number of options on tap is incredible, well worth an hour or two of your time. And if you want a view of all this from above, it only takes a second to jump out of a plane, and only a few hours to be prepared for that moment. Try Skydive Space Center. First-time jumpers of any age are encouraged, and they’ll show you the ropes in no time. Viewing NASA’s Vehicle Assembly Building, at 120 miles per hour, flying like an eagle, isn’t something you’ll soon forget. Once you’re on the ground, after all this, soon the sun will be setting on Titusville in Florida’s Space Coast, but there’s always tomorrow.